Is Your Senator Enabling Donald Trump’s Warmongering? Rand Paul tried to take away the president’s blank check for endless war, but a number of Democrats joined most Republicans in a Senate vote that let Trump keep it. 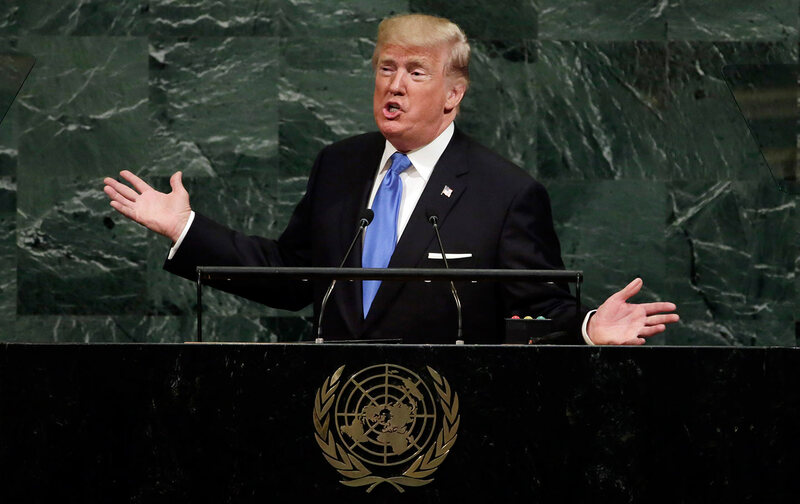 At every turn in a speech like none in the history of the American presidency, Trump outlined a belligerent agenda that raised the prospect of clashes, interventions, and wars with North Korea, Iran, Venezuela and a host of other countries. Trump kept up the saber rattling after he left the podium, tweeting: “Just heard Foreign Minister of North Korea speak at U.N. If he echoes thoughts of Little Rocket Man, they won’t be around much longer!” The North Koreans read that as a declaration of war. White House Press Secretary Sarah Sanders told reporters on Monday that was a misread. Why did some Democrats help most Republicans block a move check and balance Donald Trump’s authority to make war? That’s an unsettling prospect, and there are no guarantees with so erratic a figure as North Korean strongman Kim Jong-un. But the United States can send clearer and sounder signals than Donald Trump’s tweet storms. Unfortunately, in recent decades, Congress has tended to defer to the White House. They do this by allowing a 16-year-old Authorization for Use of Military Force, which was approved immediately following the September 11, 2001, terrorist attacks on the World Trade Center and the Pentagon, to serve as a vehicle for presidents to do as they please. That’s absurd. Presidents should not be able to rely for decade after decade on outdated authorizations; they should be required to seek fresh congressional authorizations and declarations that are appropriate to evolving circumstances. Congresswoman Barbara Lee, D-California, came close to getting the House to address the issue earlier this year, only to have the effort upended by President’s Trump’s legislative enforcer, House Speaker Paul Ryan, R-Wisconsin. Senator Rand Paul, R-Kentucky, got even closer in September—forcing a Senate vote on an amendment that would have repealed the ancient AUMF and revoked Donald Trump’s blank check to make threats and, potentially, to make war. “What we have today is basically unlimited war—war anywhere, anytime, any place on the globe,” Paul declared as the Senate prepared for its mid-September vote. I don’t think anyone with an ounce of intellectual honesty believes these authorizations allow current wars we fight in seven countries. But it turned out that only 36 senators had the foresight and the courage to vote to place reasonable restrictions on Donald Trump’s war-making powers. Paul and two other Republicans, Mike Lee of Utah and Dean Heller of Nevada, joined 31 Democrats and two independents who caucus with the Democrats, Bernie Sanders of Vermont and Angus King of Maine, in voting to reassert the authority of Congress to decide whether and when the country goes to war. This issue is not going away. There will be additional attempts to scrap the existing AUMFs, and several of the Democrats who opposed Paul’s initiative (as well as a few Republicans) may yet position themselves on the right side of this vital debate. But if all of the Senate’s 46 Democrats had joined the two independents and the three Republicans in voting to advance Rand Paul’s amendment, the process of checking and balancing Donald Trump would have been initiated. Because so many Democrats failed to step up, Trump retains a blank check that should never have been handed to him in the first place.